Driving is a common dream theme, and understanding what it means to dream about driving a car can help you better understand what is going on in your life. What Does it Mean to Dream of Driving a Car? In almost 98% of all dreams, when we dream of driving it often relates to our feelings of control in a situation. Whether we are the ones driving behind the wheel or whether we are a passenger with someone else doing the driving, it almost always relates to our own personal power in life. 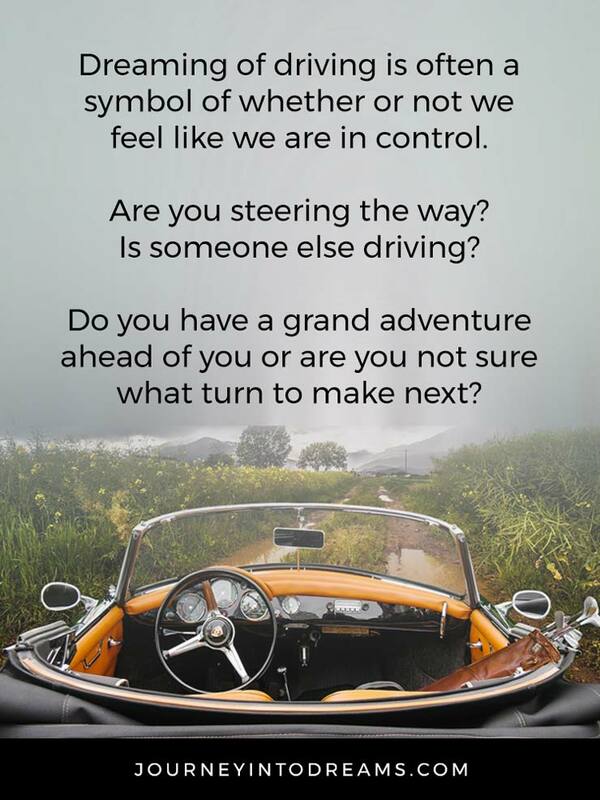 Driving is related to being able to steer and navigate where we are going. Often these dreams are about our life path and decisions we are making, but not always. If you are currently in a situation in life where you feel as if someone is controlling you or you are not in power, then it is possible this dream would reflect whatever is happening in your life currently. In order to fully understand this dream, it's important to pay attention to the whole context of the dream and the different events. You may also find these dream symbol meanings helpful to fully understand what it means to be driving in a dream or to be riding in a car where someone else is driving. Dreaming of Someone Else Driving: It is likely that you feel as if someone else or something else is influencing your decisions or what you are doing. You may feel like you are not fully in control. The other person driving in the dream could also be a symbol for some sort of aspect of yourself - is your ego leading the way? Do you feel as if your emotions are driving your life? Dreaming of a Taxi or Ride for Hire: If you dream that someone is hiring you to drive, you may feel like you have a lot of responsibilities, or it could even be a subtle suggestion from your subconscious to consider a different route to get ahead. If you dream of hiring a taxi or taking a ride share ride such as an Uber or Lyft, it could possibly mean that you are hoping an external source will solve your problems or make decisions for you. Are you relying too much on others? In order to really understand what this dream means, it can be helpful to ask yourself these questions. These make for excellent prompts in your own dream journal. How did you feel in the dream? Often times your mood in a dream will reflect your own feelings. Did you feel excited? Or nervous and afraid? How do these feelings apply to situations you are facing in your current life? Where Were You Going? Were you hitting the open road in search of a grand adventure or were you navigating your way through clouds of fog unsure of the next turn. The destination can often provide clues on how this dream relates to your waking life. What Type of Car Was in the Dream? There are many different types of cars in dreams, and they can all have a different meaning. Dreaming of a fast race car is much different than dreaming of a wagon being pulled by a horse! The colors of a car in a dream can also have some significance. Did you see any type of signs or numbers in the dream? Sometimes the signs are literal in our dreams! For example, you may dream of a stop sign, or you may dream seeing the numbers on the car clock or on a sign. Did you have a dream where you were driving a car? What do you think the dream means? Share your thoughts and experiences in the comments below!